Samuel Unwin was born in Bollington, Cheshire, around 1809. His parents are not yet known but his father was another Samuel who had named a business in Water Street (see below). Bollington was at the centre of the cotton trade in the 1800s. It was usual for children from a young age to start working in the cotton mills. The earliest record of Samuel describes him as a cotton spinner. Samuel married Mary O’Connor around 1835. Samuel was 27 and Mary 21. They lived in Water Street, Bollington and had seven children – Michael (b.1834), Mary Ann (b.1836), James (b.1840), George (b.1841), Richard (b.1843), Mary (b.1844), and Samuel (b.1845). In the early 1840s, when Samuel was a cotton spinner, he would probably have worked at one of the main cotton mills in Bollington – Clarence, Higher, Lower, Rainow, Ingersley, Waterhouse or Lowerhouse. By 1848, Samuel was a shopkeeper in Bollington dealing in groceries and sundries and described as a draper and tea dealer. 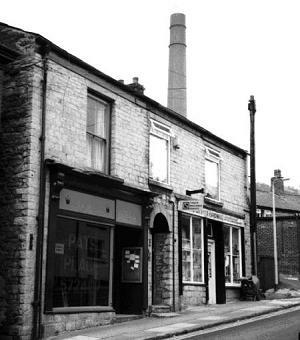 By 1864, he owned a shop in Water Street, Bollington called ‘Samuel Unwin & Son’. The son was young Samuel aged 19 years old (below). Samuel Unwin was born in Bollington, Cheshire, in 1845 to parents Samuel and Mary Unwin (above). Samuel worked with his father at ‘Samuel Unwin & Son’, Grocers and Drapers in Water Street, Bollington. In the neighbouring High Street, John and Mary Ingham, lived with their daughter, Elizabeth. John Ingham was a linen and woollen draper. It is understood that Samuel’s father was more interested in the grocery side of his business and it is probable that Samuel was trained by John Ingham as a draper. Samuel married Elizabeth Ingham around 1865/66 in Bollington. They had seven children – Annie (b.1867), Mary Helen (b.1868), Elizabeth (b.1872), Ethel (b.1875), Gertrude (b.1876), James (b.? ), and Hilda (b.1881). Samuel was said to be a very upright, stern, bearded, very typical Victorian father. He would make his children line up every evening to tell him what they had been up to. If they wanted anything, they persuaded his favourite, Ethel, to ask for it. He was a great reader and something of a seer, foretelling the time when men would fly. Samuel’s father died in 1868 and his mother in 1877. Samuel remained in Water Street till the 1880s. His father-in-law, John Ingham, died on 11 March 1891 and Samuel moved his business and his family to a larger premises at Manchester House, Palmeston Street, Bollington (pictured left). It is possible that he inherited Manchester house from his father-in-law, indeed, John Ingham’s Will indicates that he had already given £800 to his daughter by 6 July 1886 when his Will was drawn up. This suggests that John made the business over to Elizabeth and Samuel Unwin on his retirement to Brock Street, Macclesfield. In 1904, Samuel fell downstairs and, it is understood, broke a rib and other bones. A few days later, he died from pneumonia. Samuel was buried in the family vault in the Catholic cemetery. See below. 8 Water Street: George Unwin, b.1811(Clogger), and Hannah, with children Mary and Eliza. Buried in St John’s churchyard. 9 Water Street: Samuel Unwin, b.1809 (Draper and Tea Dealer) and Mary, with children Michael, Mary, James and George. 14 Water Street: James Unwin, b.1810 (Cotton Spinner) and Mary, with children Mary, Isaac, John and Thomas. 39 Water Street: Isaac Unwin, b.1803 (Cordwainer) and his son Samuel. It is possible that they were related but they didn’t all follow the same religion which suggests that some may not have been related to the others. Samuel’s family were Catholics and George’s family were Anglicans. Samuel senior died in 1868 at the age of 59 and was buried in the family vault in the cemetery of the Catholic Church of St Gregory, Chapel Lane, Bollington. His wife died in 1877 and was buried alongside him. Many other members of the family are also buried here. Samuel junior died in 1904 and was also buried in the family vault alongside his father and mother. His wife, Elizabeth, died in 1927 and is buried there too. The Samuel Unwin family have the tallest monument in the cemetery (pictured above right) being approximately 12ft high! All the information on this page was researched and very kindly provided by Alan Gavin, whose wife is a descendant of Samuel Unwin.